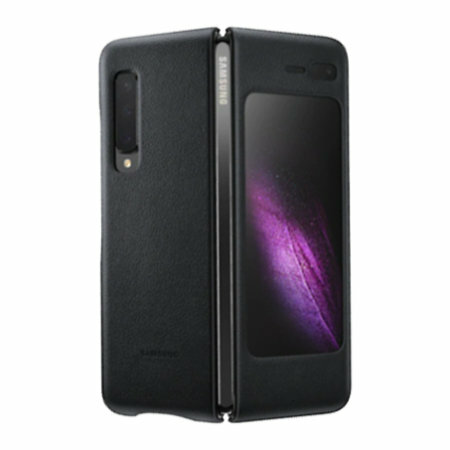 This Official Samsung Genuine Leather Cover Case in Black is the perfect way to keep your Galaxy Fold smartphone protected. Protect your Samsung Galaxy Fold from scratches, scrapes and impacts with the official Leather View cover. This case attaches onto the original back cover of your Fold, clipping on to the back of your device without adding hardly any bulk. This means that the most important parts of the phone are protected from harm without the added thickness and weight. This is an official Samsung product, so is made to the highest standards with the best quality materials. It is designed specifically for use with the Samsung Galaxy Fold, so offers a perfect fit and does not impede the use of any of the functions such as the power and volume buttons, headphone and charging ports, or rear cameras. The case also features cut-outs for the ports and features of the Samsung Galaxy Fold, including the charging connector, S Pen and camera.